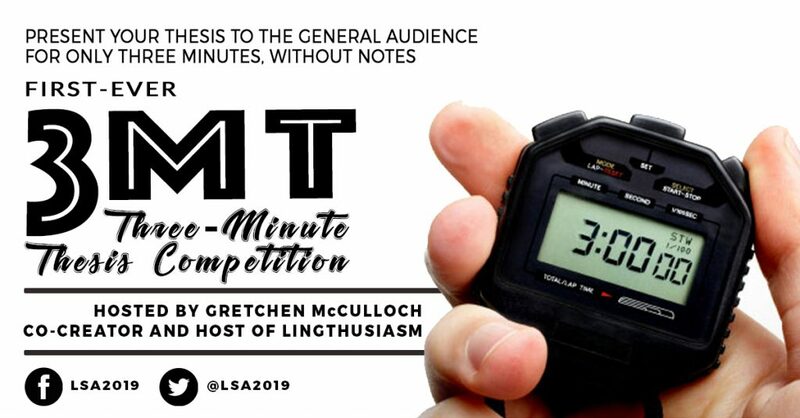 The inaugural 3-Minute Thesis (3MT) competition provides emerging linguists with an opportunity to present their research to a diverse and general audience comprised of students, faculty, and non-specialist community members from various backgrounds. Without the help of notes and with only three minutes to present, 3MT contestants must present the fundamental points and significance of their thesis in a clear, direct, and interesting way. Contestants must also impress a panel of judges, who will be looking for effective and clear presentations that are also highly engaging and entertaining. The winner will a receive a free, one-year membership to the LSA, along with the title of being the first ever LSA Institute 3MT champion. Gretchen McCulloch, co-creator and host of the Lingthusiasm podcast, will open the event with a talk on public engagement. Doctoral students specializing in any area of Linguistics are invited to submit a 300-word abstract that will be evaluated by the 3MT committee. You can now submit your abstracts to the 3MT through Orbund, our course management system. You will find the link on your account’s homepage. Deadline for abstracts is on May 1st while notifications will be sent by May 21st. Ten abstracts will be selected for the competition based on their potential to be accessible to the general public.